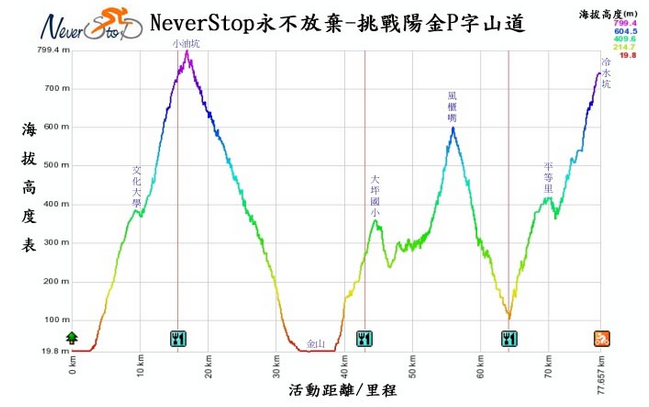 This is the elevation profile of last Sunday’s 78km annual tour of Mt. Yang Ming which towers over Taipei. 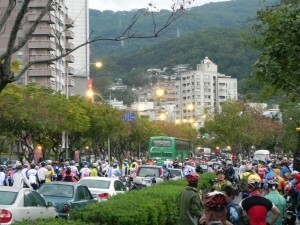 Every year, around the first weekend in December, some 4000 cyclists pit themselves against the mountain. Mt. Yang Ming is actually a mountain “area” with a number of peaks, the highest being Mt. Seven Stars. This is the main feature around which, and over which, cyclists will ride. The event involves three ascents. 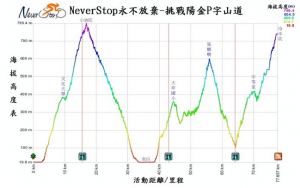 The first is the longest at 16km to the pass at 770m elevation followed by a fabulous descent to Jin Shan, 16km plus an extra 2km to a right turn to head into the next climb. 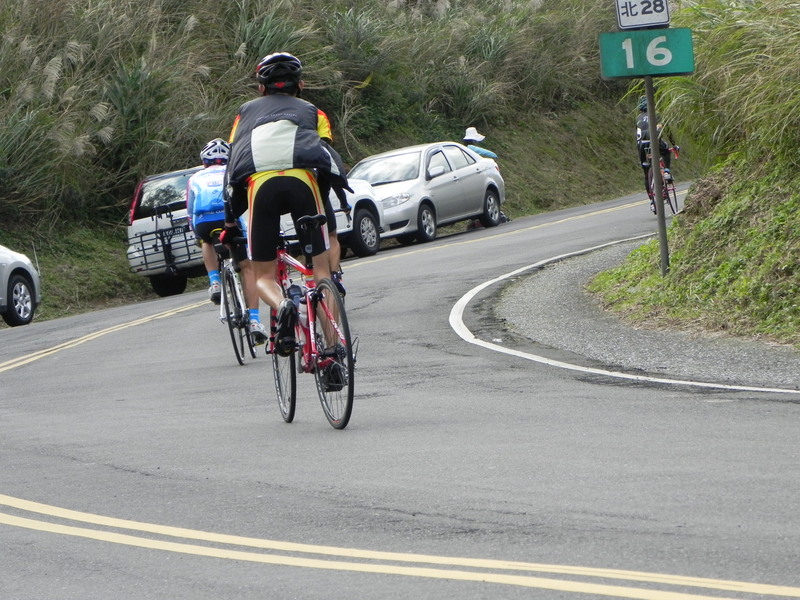 This second climb consists of two stages with a particularly treacherous short descent with sharp turns and steep gradient as cyclists complete the first part of this. The second part of the climb finishes at Fong Guei Zuei-the final 3km ascent to this pass is particularly challenging with one section measuring 22%. This is where the event begins to weigh on participants. Then follows the descent and the last climb. It is the second part of this climb, the 5km into the finish that is relentlessly steep, and is very much like the 4 km section on He Huan Shan leading into Kunyang close to the finish. 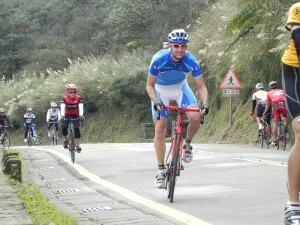 On balance He Huan Shan is harder with 2800m of vertical ascent vs. the Mt. Yang Ming course with 2200m of ascent. 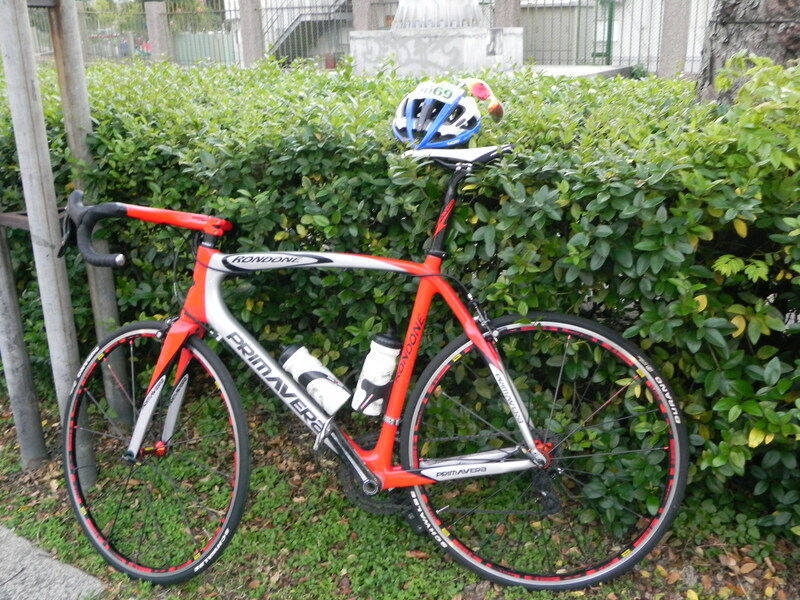 But, given the varied geography, it is for many cyclists more fun. The weather turned it on as well. The day was slightly overcast with a minimum overnight temp of 19°C, and a top of 25°C. The mountain is often veiled in cloud and going over the passes means wet, cold and windy (often howling) conditions. Not today. It was the perfect day, very lucky since a cold front came through two days later with temperatures that would have made it an ordeal indeed. This is the official map handed out by the officials as entrants register and collect their official number containing an electronic chip. This is read by a scanner above the start and the finish. 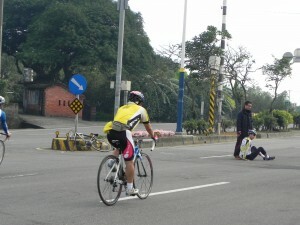 A cyclist’s time is recorded allowing calculation of overall position along with division position. Now, if you’d never ridden the course, the map is not going to do you much good. 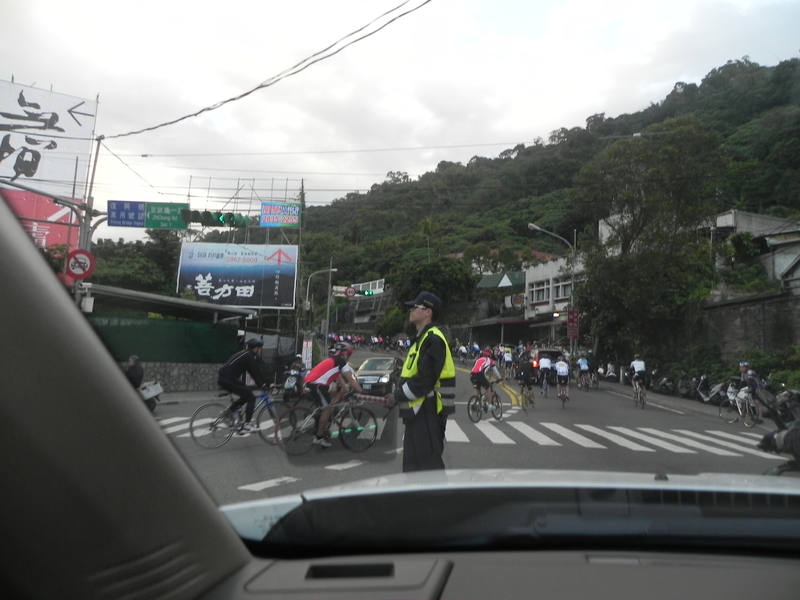 Fortunately there are course marshals at each major intersection to make sure cyclists stay on the route. 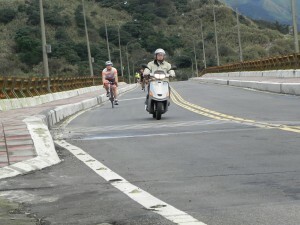 They also stand at the entry point to sharp curves on descents in an effort to avoid too much carnage. Some years can be quite bad in this respect. But this year was ok. It is usually the case that many cyclists will train on sections of the ride, or do the whole ride, in the weeks leading up to the event. It is always a good idea since it is too easy to forget how difficult this course becomes and how much mental fortitude you need to have to get up the last climb to the finish. 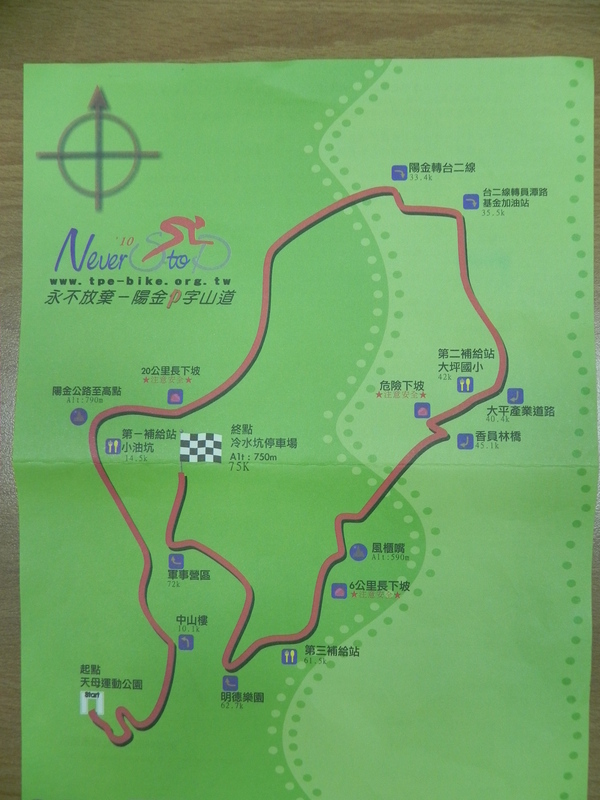 If you look carefully at the map, you might be able to make out the shape of a “P” which gives the event its name: the Yang Jin (name of the road from Taipei across to Jin Shan on the NE coast) “P” Mountain Challenge. 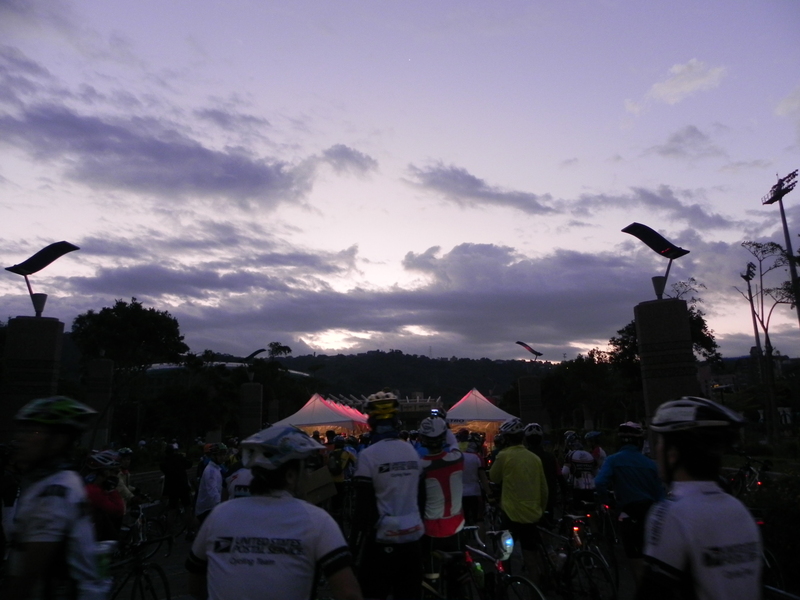 From 5am the volume of cyclists on their way to registration steadily increases. 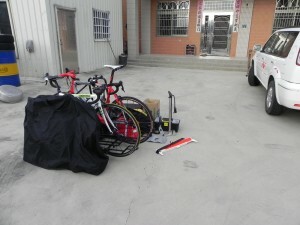 My group of cyclists prepare their gear. 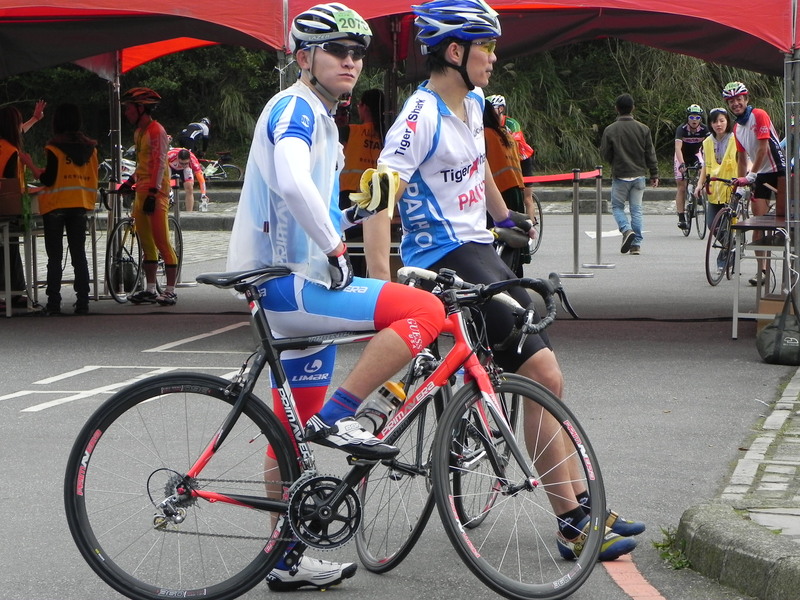 Chang on the left and You Zheng on the right head for the start. 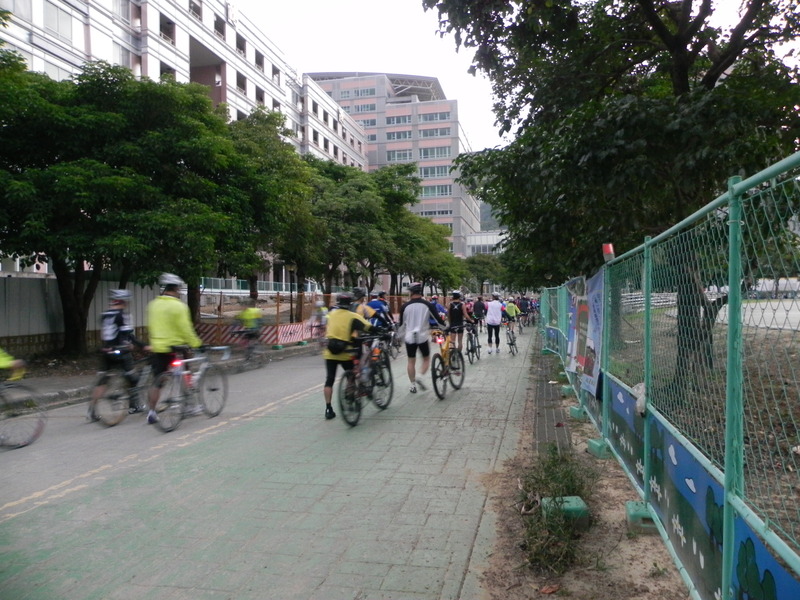 A narrow path next to the Tian Mu Sporting Complex is the feeder delivering thousands of cyclists past the scanners that will record their departure time. Dawn breaks as the line inches forward. 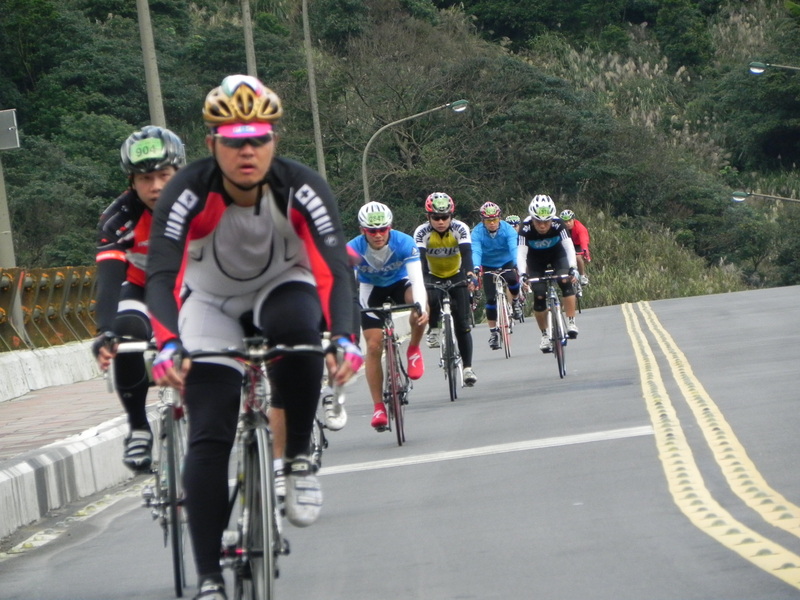 Somewhere up the front, the first riders are off the front and winding through Tian Mu’s streets in the 3km lead into the first climb. The first riders are on their way by 6.30am. On the left cyclists line up. The start and the scanners are still some 800m away to the right. The ridge in the background is the one that participants will navigate as they head around the back of Mt. Seven Stars. 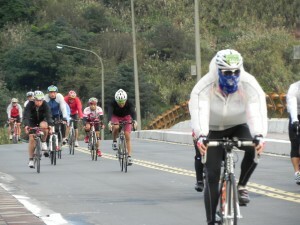 One hour after the first cyclists get away, there are still cyclists making their way through. While thousands of cyclists were heading for the scanners under the start, one rider was desperately looking for toilet facilities. If you’ve seen “Hammy” the hyperactive squirrel in Over The Hedge, you get an idea of exactly how desperate that search was. 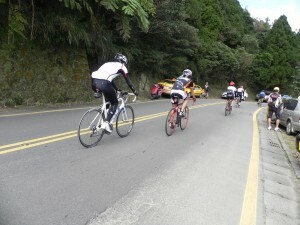 He ended up starting his assault on the mountain from the very back which meant weaving through an almost unbroken stream of cyclists on the first climb. 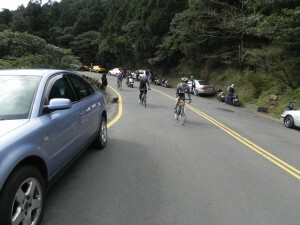 Some 3km from the start, cyclists are about to gear down for the first climb to 770m. From here you have it all ahead of you. Yang De Boulevard is the path to the pass. 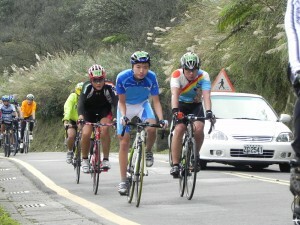 Half way down the descent towards Jin Shan the road briefly opens out for 2km or so before contracting into several more km of curves. 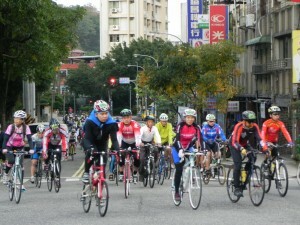 Most riders take advantage of this and let their bikes go. Scooters were a problem today. 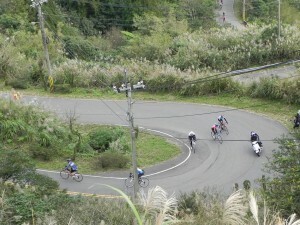 A bike can descent the mountain and cut through the curves faster. 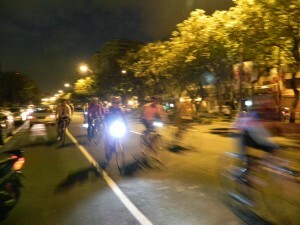 There were not many of them, but cyclists reported scooters going through curves on and over the center line severely interfering with riders’ entry to, and exit from, the curves. 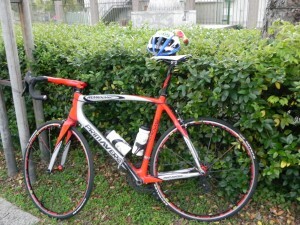 Many riders were all rigged up for the cold. As it happened, even with wind chill, today there was not need for a wind jacket. But, each to their own. At Jin Shan having just made the right turn for the approach to the second climb, a cyclist and a scooter collided. The rider was ok. But by all accounts, and as is usually the case, the scooter rider could have ensured that nothing happened. 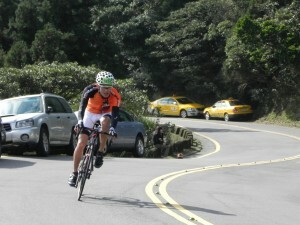 I set up on the final approach to the top of the second climb at Fong Guei Zuei. 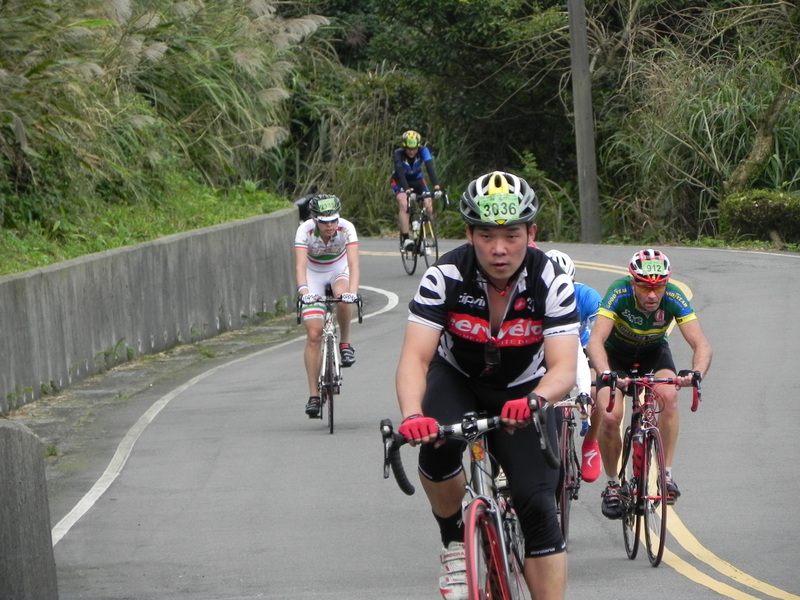 It is a 16km climb from the coast and the terrain through which cyclists must pass to get to this point is visible in the background. The key point here is the 13km road sign. 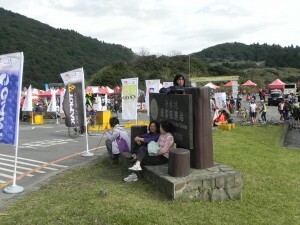 It signals the start of the final 3km to the top. 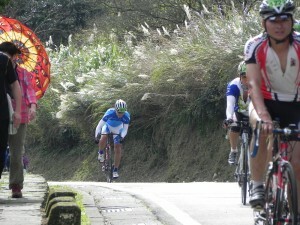 Everyone is looking for the 16km sign which marks the top. 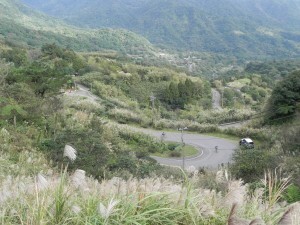 One of a dozen or so hairpin bends. Nothing exemplifies the joy of the ride than this cyclist. Truly, when you get to this point the last thing you feel like doing is smiling. But, that’s cycling. 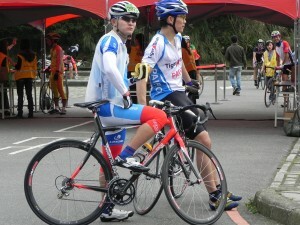 It is simply a lot of fun and so many riders expressed the simple pleasure of job well done. 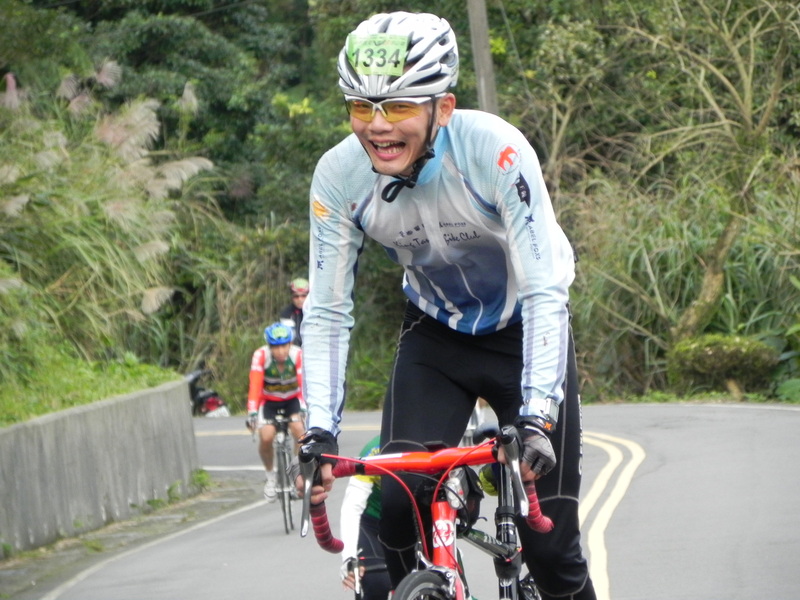 This is the great motivator and one key reason for big smiles– the 16km marker. Just around that corner the climb tops out and then it’s into full concentration mode for a technically difficult descent. The curves are tight, the road extremely narrow, and the grades steep. 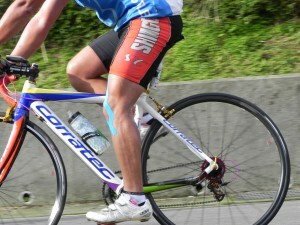 These legs were made for cycling. 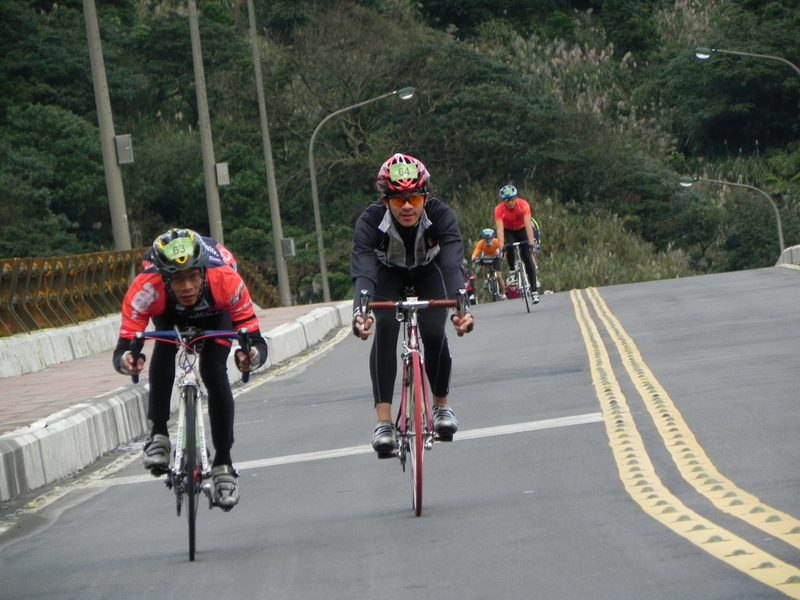 The cyclist on the far right is Raphael Grinbaum. 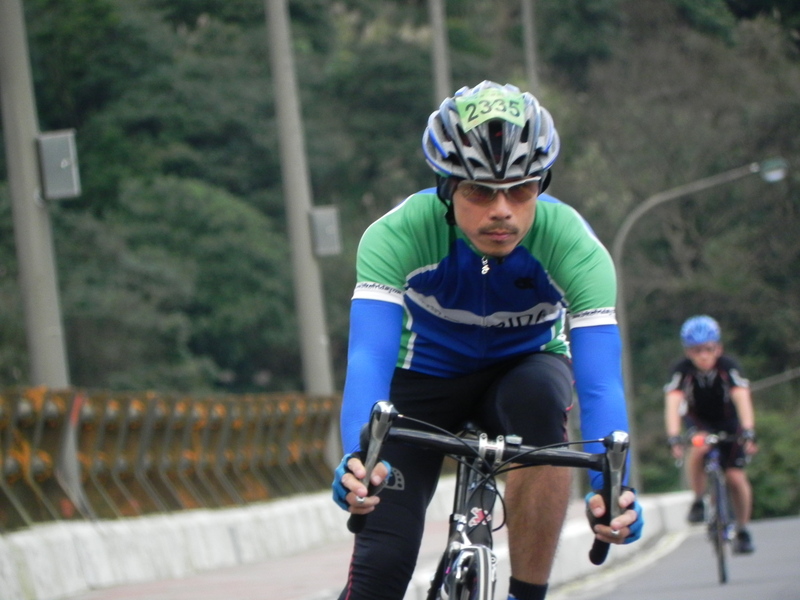 Classified in the M50 group he went on to achieve 7th place overall in 3hrs 13min, an outstanding effort. There were plenty of ladies out today doing an outstanding job. From here I navigated my way to the top of the final climb, just short of the finish. This is where everyone is just hanging out for that sighting of the finish and the end to the punishment of this relentlessly steep final section. Yep, guys, it’s just around the corner. 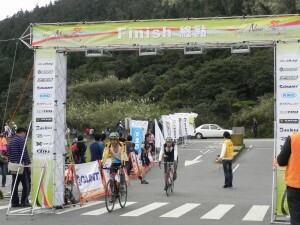 Many participants powered into the finish. There are always many very strong and very capable cyclists who take advantage of the opportunity to test themselves against the clock and other riders who make these events a great spectacle. 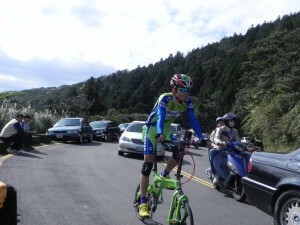 The guy on his green Birdy from the Stone Gate Reservoir event a few weeks ago! No, just around the corner the finish comes into sight. 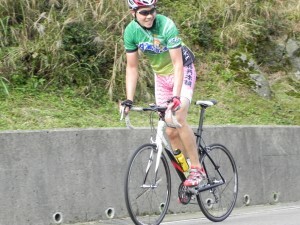 The slight descent into the finish gives you a chance to recover any dignity you may have lost, enabling even the most spent cyclist to sweep through in grand style. Chang was the first of my group to arrive. 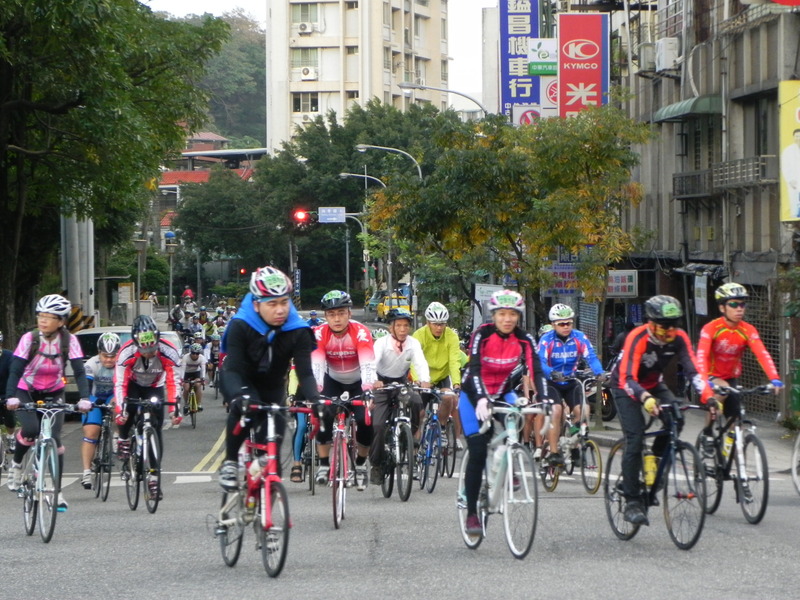 3179 cyclists finished the day, 14o of whom were ladies. The fastest time was 3hrs 4min. The slowest 9hrs 30min. 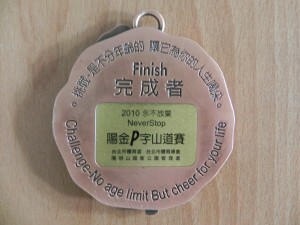 Chang achieved 16th place overall in a time of 3hrs 19min; he was 10th in his age category out of 806 who finished. Next was You Zheng in a time of 3hrs 30min, putting him in 47th place overall and 12th in his age category. He lost time on the descents today. Since having crashed a few weeks ago, he is exercising caution as he rebuilds his confidence and hones his cornering skills. Finally Glenn came in a time of 3hrs 43min 103rd overall and 6th in his age category. The energy expended in looking for a “rest room” very early in the day may have added a minute or two to his time today. Chang enjoying a recovery banana. 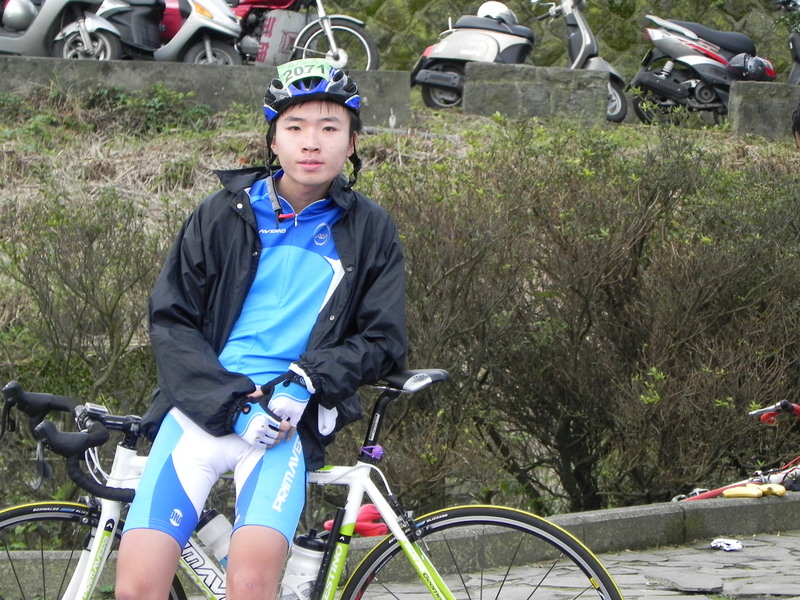 You Zheng reflecting on an interesting ride. He has never done this one before and is pleased with the way the year has ended. 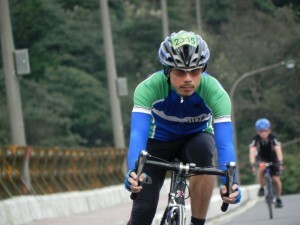 He’s looking towards a great 2011 and many more great rides. 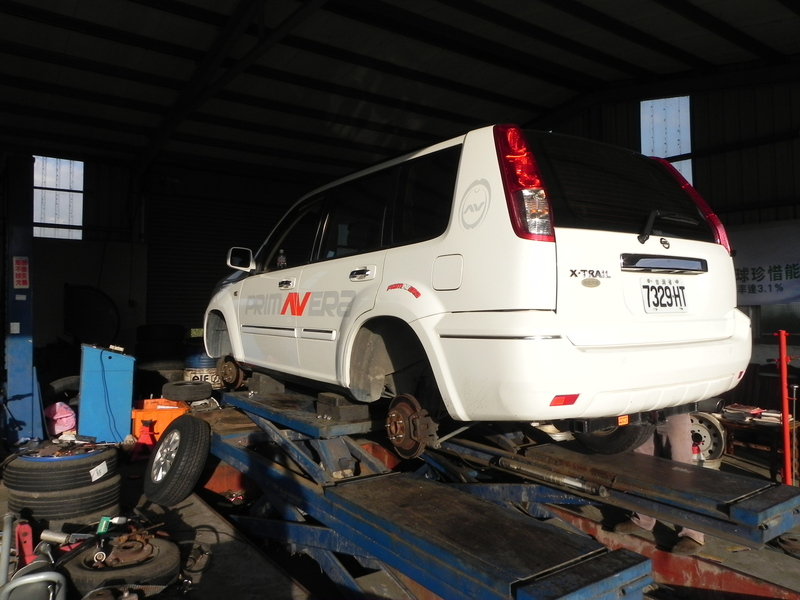 On the way back to Taichung one of the rear tires just could not wait for next week’s scheduled replacement and rotation. We had to stop and get it done this afternoon. Chang demonstrated something he learned whist doing boring descents of Mei Shan. 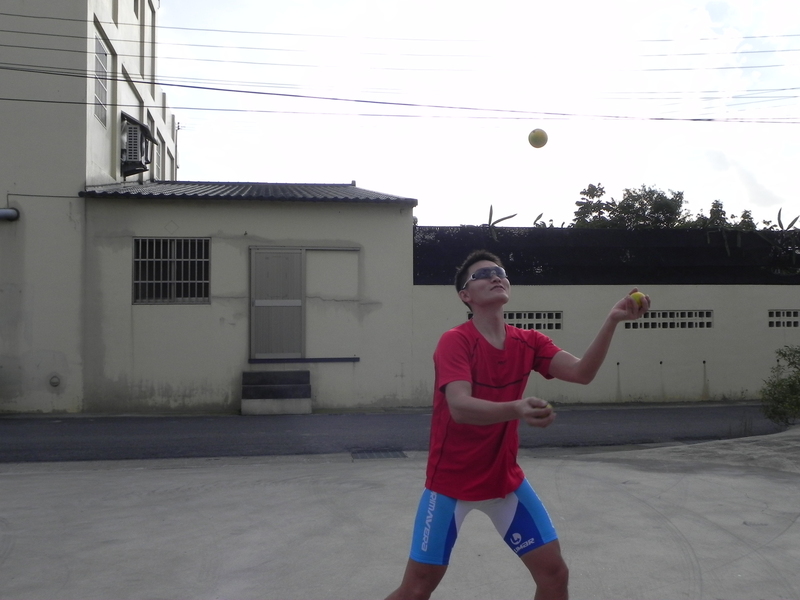 We have seen him taking phone calls as he passes on the inside of slower cars and trucks through the tightest of curves, so would not be at all surprised to see him juggling several oranges. Everyone who completed the day received a medal. 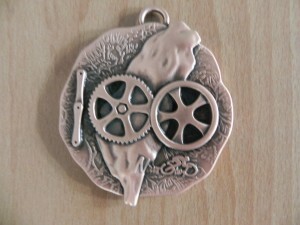 The cranks, chain ring, and wheel are in the shape of “100”. Next year marks the 100th anniversary of the founding of the Republic of China which is these days more commonly known as Taiwan. (I will leave the politics of all this for another time and place). A nice momento of a great day on the road.